A common diet myth is that milk contains too much fat and should be cut out when you are trying to diet, according to the National Diabetes and Digestive and Kidney Diseases. In reality, low-fat and fat-free milk--along with other dairy products--offer multiple nutrients such as calcium, protein and vitamin D without excessive saturated fat or calories. Including milk in your diet can help you lose weight. Several studies have linked drinking low-fat milk to weight loss. Among them is a study published in the August 2009 issue of the “Journal of the American Dietetic Association,” in which researchers from the Department of Human Nutrition, Foods and Exercise at VirginiaTech concluded that consuming at least three servings of low-fat dairy intake may help to improve the diet quality and weight management of young adults. Curtin University in Australia performed a study comparing the weight and fat loss results of dieters eating three servings of dairy versus five servings of dairy daily. The results, released in October 2009, found that the higher amount of dairy, consumed as low-fat milk, cottage cheese and yogurt, yielded significantly greater amounts of weight and fat loss after 12 weeks. Skim milk contains fewer calories and more nutrition than soda, energy drinks and sweetened teas. Due to its protein content, milk may also make you feel more satisfied than sodas or other sugar and corn-syrup sweetened beverages. Avoid flavored milks, which often contain significant amounts of added sugar and, as a result, calories. Use 1 percent or skim milk, as they contain little to no saturated fat. Use milk as a protein source to help increase your feelings of fullness by pouring it over cereal or mixing into a fruit smoothie. Skim milk may also be added to mashed potatoes, soups and casseroles to boost nutrition and flavor without adding sugar and fats that encourage weight gain. The U.S. Department of Agriculture recommends that adults to take in three 8-oz. servings of dairy daily to support good health. When cutting calories to lose weight, eliminate discretionary calories first--such as added sugars, alcohol and fats--before nutritious foods such as non-fat milk. During your weight loss program, milk can help to enhance your exercise efforts to change your body composition. 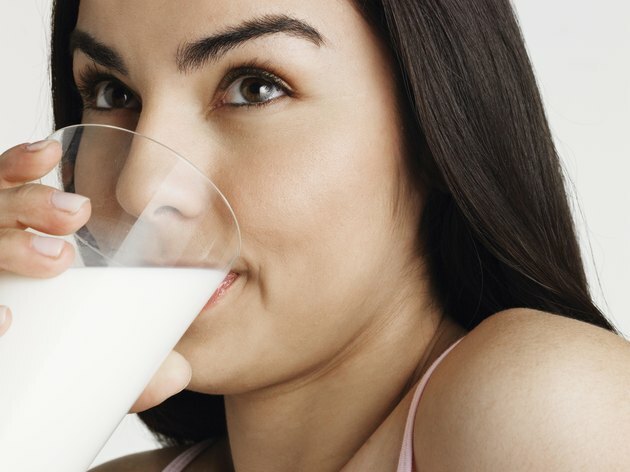 Consuming milk versus a carbohydrate drink soon after exercise resulted in greater muscle mass development, fat mass loss and strength grains in women after 12 weeks, concluded researchers from McMaster University in the journal "Medicine and Science in Sports and Exercise" in June 2010. Their findings confirmed earlier similar results in a study involving men.